Showing off is a good thing. Showing off is a mindset. 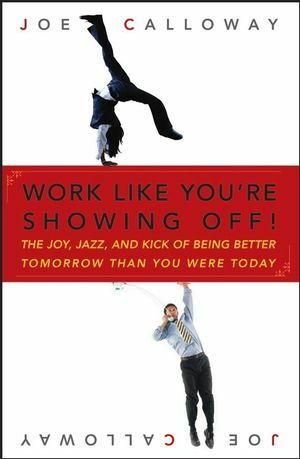 Showing off is about living life and doing work in a way that creates joy, jazz, and a kick in our lives and in the lives of those around us. This is a business book for almost everyone–from executives and managers to receptionists and sales clerks. Here’s the key: success is an inside job. After 26 years of studying and working with top performers, Joe Calloway shares the key factors in creating success–without pulling any punches. Work Like You’re Showing Off! isn’t for sissies; it’s a tough, realistic approach to getting the most out of life by giving more to others. What have you done for me next? Joe Calloway is an expert on high-performance organizations and individuals, the owner of an award-winning restaurant, and a member of the International Speakers Hall of Fame. His clients read like a Who's Who of business—from newspapers in Sweden, hotels in Great Britain, and computer companies in South Africa to world brands like BMW and American Express. He is also the author of Becoming a Category of One and Indispensable, both from Wiley.